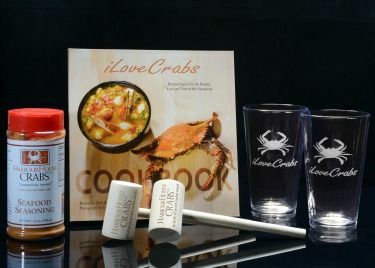 This deluxe package is sure to impress and be a very special gift for any crab lover. 60+ carefully crafted recipes along with colorful and mouth-watering photographs you can almost taste. Frosted, custom designed and sure to enhance the taste of any cold beverage. A perfect blend of salt, spices and paprika and the secret ingredient in how we steam our shrimp. Used for cracking open hard shell crabs. Includes Free Ground Shipping Anywhere in the USA! This Offer May End at Any Time. Only While Supplies Last.